(WHITE PLAINS, N.Y.) – The USTA recently announced that the US Open National Playoffs will return for a fourth year to expand the footprint of the US Open to cities nationwide by providing the opportunity for all players 14 years of age and older to earn a berth into the US Open. 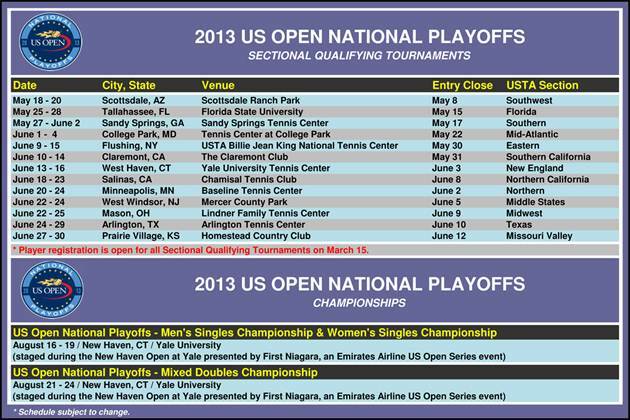 The US Open National Playoffs will again include both men’s and women’s singles, as well as mixed doubles in 2013. The Southwest Section Qualifying Tournament will return to Scottsdale Ranch Park for the third consecutive year. Last year's champions were Stephanie Vlad (women's singles - pictured right) and Brian Battistone (men's singles). Battistone also captured the mixed doubles title with Nicole Melichar, and the pair went on to win the National Qualifying Tournament and earned a spot in the main draw of mixed doubles at the 2012 US Open. This year's US Open National Playoffs men’s and women’s singles champions will again earn a wild card into the US Open Qualifying Tournament, held the week prior to the US Open. The US Open National Playoffs mixed doubles champions receive a wild card into the main draw of the 2013 US Open. "Anyone who dreams of playing in the US Open—top junior players, collegians, teaching professionals, ‘weekend warriors,’ or recreational players—can make that dream a reality through the US Open National Playoffs," said Dave Haggerty, USTA Chairman, CEO, and President. 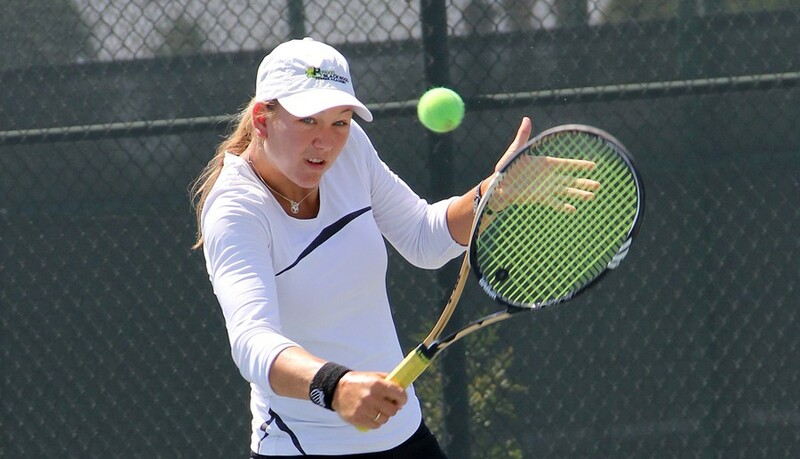 "The level of singles and mixed doubles competition is always strong, while our committed USTA sections do a terrific job running the sectional qualifying tournaments. It all makes the event unique and special for our sections, US Open fans and tennis players across the country." Registration and additional information for each of the 13 sectional qualifying tournaments begins on March 15 at www.USOpen.org/NationalPlayoffs. The entry fee for each of the sectional qualifying tournaments is $100 for singles and $120 for each mixed doubles team ($60 per player). 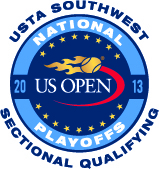 All players competing must have a current USTA membership valid through August 26, 2013. The US Open National Playoffs begin as a series of sectional qualifying tournaments and will be held in 13 USTA Sections throughout the country (see complete schedule below). The 13 men’s, women’s and mixed doubles champions or top available finishers from each sectional qualifying tournament will advance to the US Open National Playoffs – Men’s and Women’s Singles Championship, held August 16-19, and the Mixed Doubles Championship, held August 21-24. All three tournaments will take place in conjunction with the New Haven Open at Yale presented by First Niagara, an Emirates Airline US Open Series event. Tickets for the 2013 New Haven Open at Yale went on sale on Tuesday, March 5, and can be purchased at www.emirate​susopenseries.com. "It’s always amazing to see the passion and determination of those competing to fulfill their dreams of playing in the US Open," said Derek Fisher, US Open National Playoffs Tournament Director. "We’re excited for another group of talented players and the perfect host—The New Haven Open at Yale presented by First Niagara—to make the fourth US Open National Playoffs the strongest yet." A player may only compete in singles and/or mixed doubles at one sectional qualifying tournament during a calendar year. Players competing in men’s singles or women’s singles and mixed doubles may opt to compete at different sectional qualifying tournaments for each event (one for singles and one for mixed doubles). The draw size at each sectional qualifying tournament will be a maximum of 256 for each singles event and a maximum of 128 teams for mixed doubles. Participants can be of any playing level, giving everyone an equal opportunity to advance. 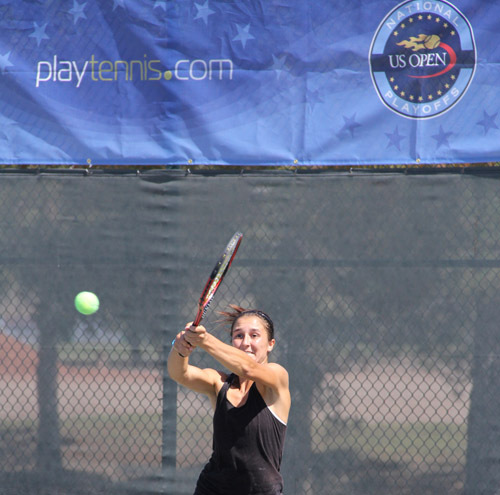 More than 1,200 players competed in the 2012 US Open National Playoffs, ranging from experienced professionals who were once ranked in the Top 50, to upcoming junior players, to current and former college standouts to recreational players of all playing abilities and walks of life. Participants included those competing for charities as well as pastors, musicians, lawyers, reporters and stay-at-home mothers. Former notable participants include Olympic skier Bode Miller and ESPN’s Mike Greenberg, who teamed with six-time US Open champion Chris Evert in mixed doubles. The US Open Qualifyig Tournament will be held August 20-23 and the US Open Mixed Doubles Championship begins August 28 at the Billie Jean King National Tennis Center in Flushing, N.Y. The 2013 US Open begins on August 26. Additional information on the US Open National Playoffs is available now at www.USOpen.org/NationalPlayoffs.